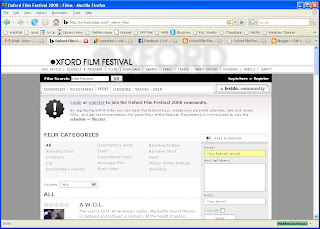 Oxford Film Festival Take 5 With...: 2008 Schedule has been posted! 2008 Schedule has been posted! We are pleased to announce that the lineup and schedule for the 2008 festival has been posted online at http://www.oxfordfilmfest.com -- almost 90 films! Thanks to our new partnership with B-Side, our website now has all kinds of bells and whistles. Create a login for yourself, and take the site for a test drive! Create your own personal schedule, rate the films you see, and link your profile to your blog.